"Wat heeft Rien nu weer gezien"  - What again Rien now has seen. 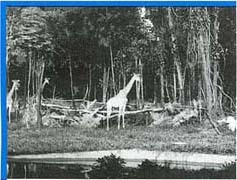 In this way the first lighted safaripark in the world was photographed. The interview comes to an end. 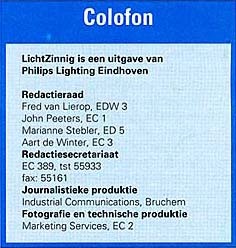 Rien Valk takes his things and leaves to go to The Hague to take photographs of QL-streetlighting. He hardly had the time to choose some photo's to illustrate this article. But a photograph of Valk himself? That will be difficult to find. Because a photographer stands mostly behind the camera and not in front! 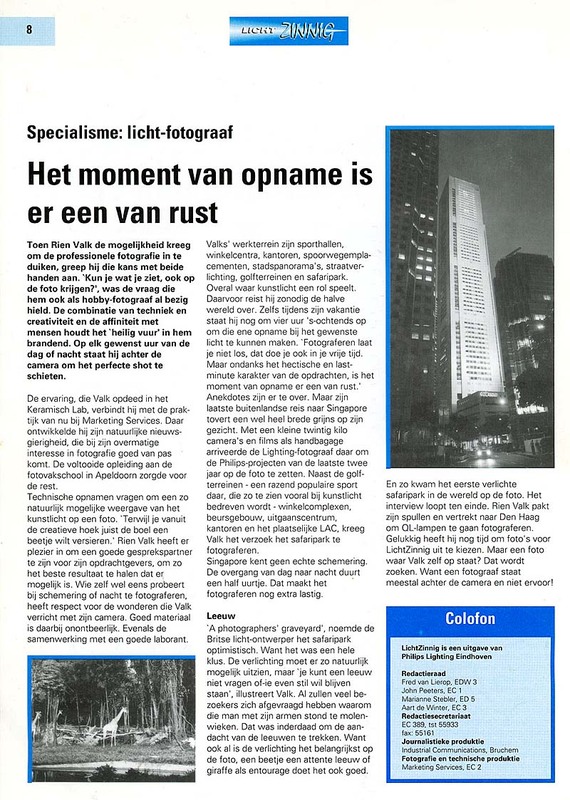 At the moment when Rien Valk got the possibility to turn into the professional photography, he took that chance with both hands, 'can you get on film the lighting effects which you see? 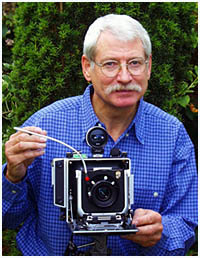 ', this question kept him also occupied as an amateur-photographer. The combination of technique, creativity and the affinity with people keeps the fire in him burning. On each desired hour of day or night he stands behind the camera to shoot the perfect shot. He now links the experience, which Valk acquired in the ceramic laboratory, with the photographic practice at marketing services. In that laboratory he developed his natural curiosity, which served him well in his big interest in photography. The completed training at the professional photography school in Apeldoorn did the rest. Technical lighting photo's ask for a reproduction as natural as possible of the artificial light. Whereas you want to enhance things a little bit seeing it from the creative point of view. Rien Valk has pleasure in being a good conversation partner for his customers thus obtaining the best result possible. One who tried sometimes to make pictures during dusk or night has respect for the miracles Valk did with his camera. Good material thereby is essential. As well as the cooperation with a good photolaboratory assistant. Valk's work area are sport halls, shopping centres, offices, railway yards, town panoramas, street lighting, golf areas and safari park. Everywhere where artificial light plays a role. For that he travels half the world if nessecary. Even during his holiday's he rises at four in the morning to take that special picture with the desired light. Photography don't leaves you alone and keeps you busy also in your free time. But in spite of the hectic and last-minute character of the shootings, the decisive moment is one of calmness and peace. Anecdotes more than enough. But his last foreign travel to Singapore brings a broad smile, on his face. With about twenty kilos of cameras and films as hand luggage the lighting photographer arrived there to put on film the Philips projects of the last two years, beside the golf areas - an enormous popular sport there, which is so to seen especially played with artificial light - shop complexes, entertainment centre, offices and the local LAC -, Valk got the request to photograph the safari park. Singapore has no real dusk. The passage of day to night lasts less than half an hour. That makes photographing extra difficult.
' A photographers ' graveyard, called the British lighting-designer the safari park optimistic. Because a complex job with all those different lightsources. The lighting must look as natural as possible, but ' you cannot ask a lion whether he will pose for you ', Valk illustrates. Many visitors will have wondered themselves why that man was waving with his arms. That was indeed to attract the attention of the lions. Because although the lighting is the most important on the photograph, a little attentive lion or giraffe as entourage does it also good.